As shrinking higher education budgets leave staff and precarious workers in a bitter battle to hold ground, we must make space for graduate student unions on campus, writes Brian Kamanzi. Debates on the form, function and direction of the process of decolonisation at South African universities, among many other spaces, have renewed impetus since the student-worker uprisings of 2015. Alongside this line of inquiry, the role of university both historically and looking into the future has become a key site of contestation. Proponentsâ€™ arguments range from calling for increased support and work towards making the university a space that contributesÂ to social transformation and social justice, to suggesting that the university has a role to play in revolutionary activity. What these debates have in common is the growing expectation thatÂ tangible gains be realised off the back of the critiques leveled against the status quo, and their reinforcement of institutions in the heat of fire, battle through protest and bitter rounds of negotiation. As the movement fractures internally, and vice chancellors and the state ramp up bureaucratic and militarised responses, we should look to older, traditional organising forms for ideas on interventions that could help consolidate the momentum developed to date. This is not a new phenomenon but it signals the extent to which graduate students are leading the push towards more collectivised responses. 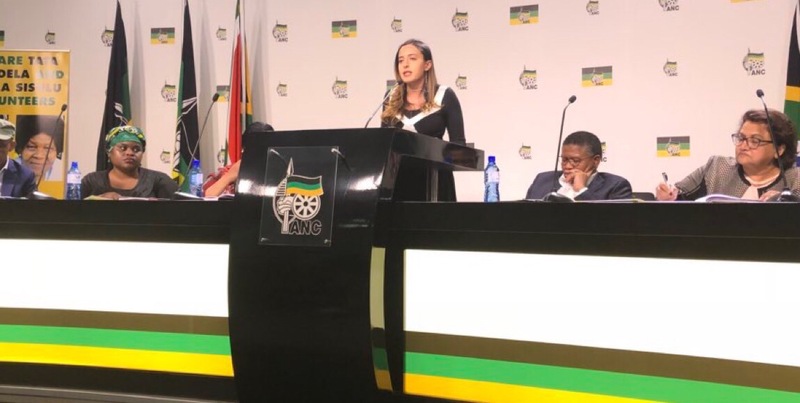 At even the most elite universities, overcrowding, unequal treatment, wage fluctuations across faculties, rapidly expanding class sizes and, in the case of South Africa, fear of intimidation or victimisation over oneâ€™s political activism are on the rise. Under neoliberalism and under conditions of near permanent â€œausterity measuresâ€ for everyone outside of the executive team permanent academic posts are short supply while access to the university, particularly at an undergraduate level, has increased. With this has come a university model that is highly dependent on short term academic workers comprised of tutors and teaching assistants, usually recruited from senior undergraduate years, and graduate students, often for a semester at a time. At the University of Cape Town, where I am based, we have seen cases where graduate students have attempted to organise and use their labour power to support largely undergraduate and worker based strike action. In one instance, a collective of humanities tutors organised to help bring graduate students together under the banner of â€œUCT pens downâ€ calling for a strike among tutors. This was during the campus shutdown in 2016, when online learning was used to undermine the strike and students who had less access to computers and the internet faced the brunt of this discrimination. 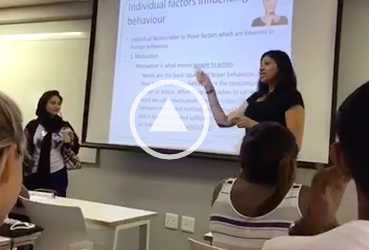 Tutors offered academic support and lobbied to protect students from punitive administrative judgements relating to deferred exams and late submissions due to trauma or stress. 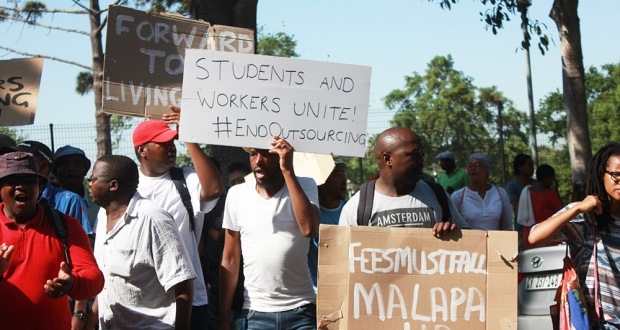 Looking forward, it would be naive to consider any â€œsolutionâ€ to the demands of the #FeesMustFall and #EndOutsourcing campaigns that do not include, at some level, the building of organisations and institutions that are able to hold the door open for future actions while also protecting gains. Joint bargaining councils between graduate students working as tutors and teaching assistants in concert with catering staff, maintenance staff, security guards, administrators and progressive staff could prove instrumental in the fight to protect what has been won against outsourcing to date. After all, it took over 20 years of struggle on our campus alone to roll back some of the labour-brokering agreements from the Ramphele administration. Throughput of black students up to PhD level have consistently featured as a serious concern across South African institutions. In the context of the demands for curriculum reform and the re-examination of pedagogical practices in classroom spaces, it is essential going forward for graduate students to hold space and organise to propose and secure strategic posts and influence in a modernising university system – a system that sees us either as tokens, cash cows, or paper-publishing-machines beholden only to rankings and disconnected from the very struggle that brought us into these instituitions. Building organisations like graduate students unions for collective bargaining could strengthen the repertoire and capacity of existing movements, like the #FeesMustFall movement, that are seeking to agitate for institutional changes. Much like academics unions and administrative staff unions across several campuses, if concerted political work is not put into establishing long term relationships of solidarity, and if continuous efforts are not put towards political education then graduate student unions could possibly become the future enemies of movements like #EndOutsourcing as shrinking higher education budgets leave staff and precarious workers at all levels in a bitter battle to hold ground. comrades although I am not there I strongly urge you all as individuals plus as groups to weigh who, what, where, when plus why of existing conditions plus proposed by authorities future conditions as they relate to how, how long, how much plus how often of conditions inclusive of various steps plus stages of actions authorities are intending to take plus most of all determine what is in best interest of learning that will prepare you all to fulfill essential roles of a modern living Buntu community. In determining what in best interest of learning you all would be stupidly wrong to consider what you want unless it contribute to methods used in teaching, security while learning plus availability school. Remember university is there to teach plus prepare you all to be a contributing member of your community. It is not there to be entity beyond teaching to you all methods on how to contribute to society development plus maintenance thus, should not be used for much beyond school related business. Very much sincere, Henry Price Jr. aka Obediah Buntu IL-Khan aka Kankan aka Gue.